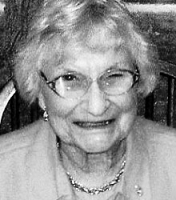 GOZDOWSKI Evelyn R. Evelyn R. (Wauters Kimerer) Gozdowski, loving mother, grandmother and great-grandmother, age 90, passed away Wednesday, December 7, 2011. Evelyn was born September 6, 1921, in VanBuren, Ohio to Leon and Anna (Lauwer) Wauters and was a resident of Holland, Ohio for over 50 years. In 1939 she graduated from Haskins High School where she starred as a guard on the basketball team. Evelyn was an LPN at the former Parkview Hospital, The Toledo Hospital and Dana Nursing Home and also worked with the students in registration at The University of Toledo. Evelyn was a member of the Holland American Legion Post Auxiliary and volunteered for the Hospitality Kitchen at Our Lady of Lourdes Parish where she also belonged to the St. Francis Guild and the Daughters of Mary. She cherished most the time spent with her family. Evelyn was preceded in death by her parents and husbands, Orren Kimerer and Edward Gozdowski. She is survived by her daughters, Marilyn (John) Kasmier, Marjorie Barnard and Diana (Rick) Waller; sons, James (Denise) Kimerer and Edward (Kerry) Gozdowski; brothers, Henry Wauters of Rehboth, Delaware and William Dibling of North Carolina; sisters-in-law, Alonzo Gozdowski, Madeline Kamer and Othella Hoyt; 11 grandchildren and 18 great- grandchildren. Friends and family may visit Friday from 2 to 8 p.m. at W.K. Sujkowski & Son Funeral Home, 3838 Airport Hwy., where the Rosary will be recited at 7 p.m. Funeral services will begin with prayers at the mortuary on Saturday, December 10, 2011, at 9:45 a.m. followed by the Mass of Christian Burial at 10:30 a.m. in Our Lady of Lourdes Catholic Church. Interment will follow at St. Joseph Cemetery, Maumee. Tributes in Evelyn’s memory may be made to the Hospitality Kitchen at Our Lady of Lourdes Parish.